For the fifth time in the history of the United States, the Electoral College and the popular vote are at odds following Election Day. But what would happen if, on December 19th, the Electors decided to vote based on the results of their individual states? With a voting gap (at time of writing) of over 300,000 votes between Secretary Clinton and Mr. Trump, it feels more than ever like the current electoral system in the United States is broken. The latest vote tally, according to Google, shows Clinton over 300,000 votes ahead. 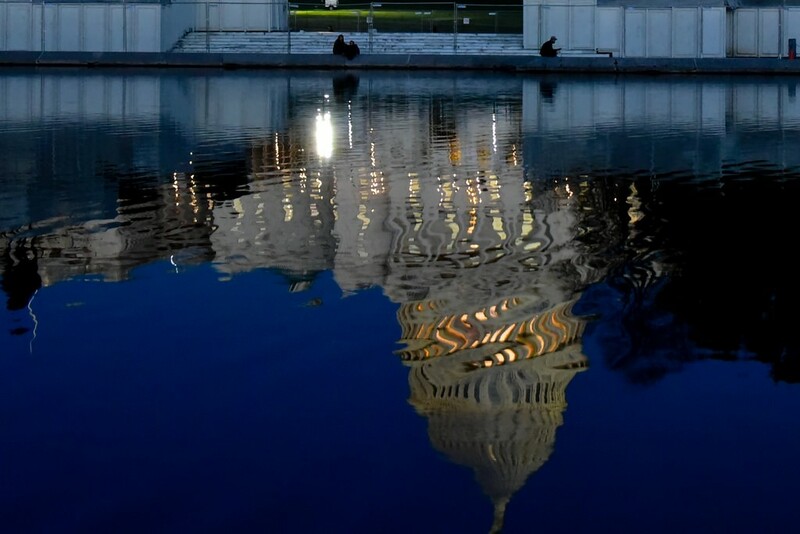 Traditionally, the United States isn’t governed by direct democracy. The people (generally) don’t vote on laws, but instead elect Senators and Congresspeople to vote on laws for them. The same is true with the Electoral College and presidential elections: when you voted for Trump, Clinton, Stein, Johnson, McMullin, or any other candidate, you voted for your state’s Electoral College Electors who were chosen by your candidates party. The Electoral College isn’t going anywhere in the next two months, and the process has already begun. But what if the Electors voted how their States voted? Traditionally Electors who vote against their state’s popular vote majority are called Faithless Electors. For this thought experiment, let’s call them Faithful Electors — as they would be attempting to more faithfully represent all voters in their respective states. What If Each States’ Electors Voted In Line With The State? We wouldn’t have a president-elect. Based on an analysis of the latest tallies as of the morning of November 10th, a state-by-state popular vote split of Electoral College votes would result in a lot of redistribution of votes. As a result, no candidate would have the required majority of Electoral College votes needed to become the next president. Before you start getting too excited about this hypothetical Faithful Electors proposal, remember that this year it would take Electors going wildly off party lines for it to become a reality. Members of the Electoral College are (in most states) chosen by their political party. Due to the winner-take-all conditions of all but two states, any red state will have all Republican-selected individuals as their Electors, and vice versa for blue states. How Would The Electoral College Vote Change? In a hypothetical Faithful Elector world, how would the results of the 2016 election be different? Comparing Faithful Elector results with projected Electoral College results (assumes Trump takes Michigan and Clinton takes New Hampshire). Yes, the Faithful column doesn’t add up to 538 because I rounded to the closest whole number. 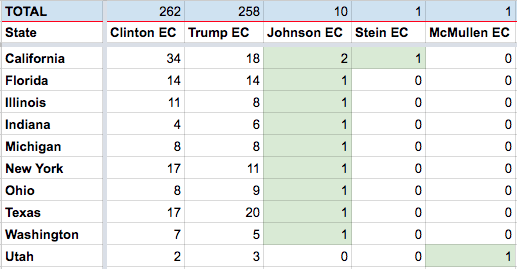 Johnson had a strong showing — and that would keep the totals well below the 270 threshold. Third parties would take away electoral college votes from the two main parties. It’s easy to argue that this has “happened before” in swing states where the voting gap between the two top candidates has been less than the total votes for a third party candidate (The best example, of course, is Florida in 2000). In this new system, Johnson, Stein, and even McMullen would earn Electoral College votes. 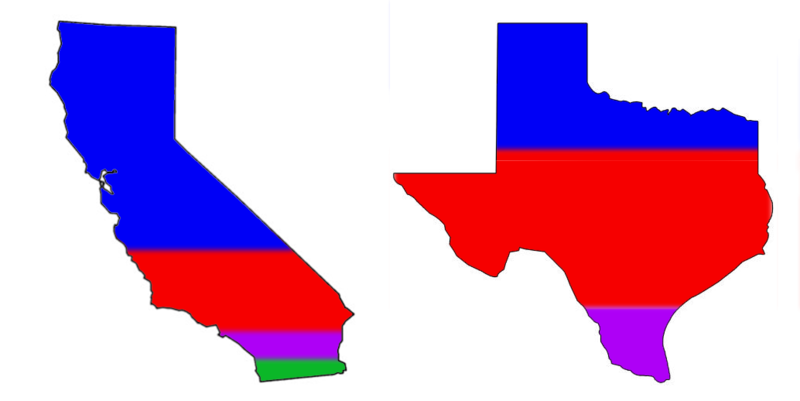 Traditional strongholds like California and Texas would feel much more fairly distributed — especially for non-majorities. Swing states no longer hold more election power than any other state. Similarly, large “stronghold” states are weakened. On average, every single Electoral College vote in a Faithful Electorate system would determined by about 209,064 voters. If more voters turn out on Election Day, this number would go up. Less voters turn up? It goes down. The new “swing states” might be states where there’s a low voter turnout versus the population. Yes, Maine and Nebraska both have a system that attempts to be more representative of the actual vote in their state. Each state gives two Electoral College votes to the winner of the popular vote, and then assign additional votes to candidates based on the outcome in individual congressional districts. Until we’ve solved the issue of unfair state congressional districts, Maine and Nebraska’s solution suffers from the same problem as the current electoral college system: your vote might not matter if live in “non-swing district”. In our imaginary Faithful Electors world, what would happen after no candidate “wins” with a majority of the Electoral College votes? If somehow this happened on December 19th, then according to the 12th Amendment, the newly elected House of Representatives has to immediately go into session. 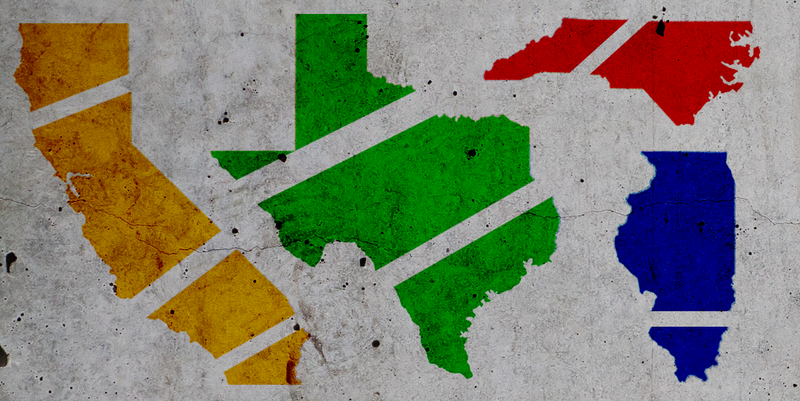 In this emergency meet up to decide the next leader of the free world, each state votes “en bloc” — one vote per state. They’re only allowed to vote for one of the top three candidates (based on Electoral College totals). Washington D.C. doesn’t get a vote, so in order to win, a candidate would need 26 states to vote for them. Assuming that each Representative voted based on the popular vote of their states, Donald Trump would have 29 states behind him, and be elected President. Assuming that each Representative voted with their own party, and any ties within states were stalemates, it would lean even more towards Trump — with 33 states set to have Republican majorities in the House. But very few Republican representatives have supported Trump in his run for president, so perhaps things would end up differently. But support during a campaign isn’t the same as support after an election. Dan White is a Managing Editor for DJ Techtools, with a casual passion for Excel spreadsheets and hypothetical political situations.